We fish nearly 200 miles of the Clarkfork, with Missoula sitting right in the middle as our home base. All the other rivers of Western Montana eventually flow into the Clarkfork. The Lower Clarkfork carries the water from the upper Clarkfork, Rock Creek, the Blackfoot and Bitterroot northwest to the Idaho border. The Clarkfork River is home to one of the largest successful environmental restoration projects in the U.S. 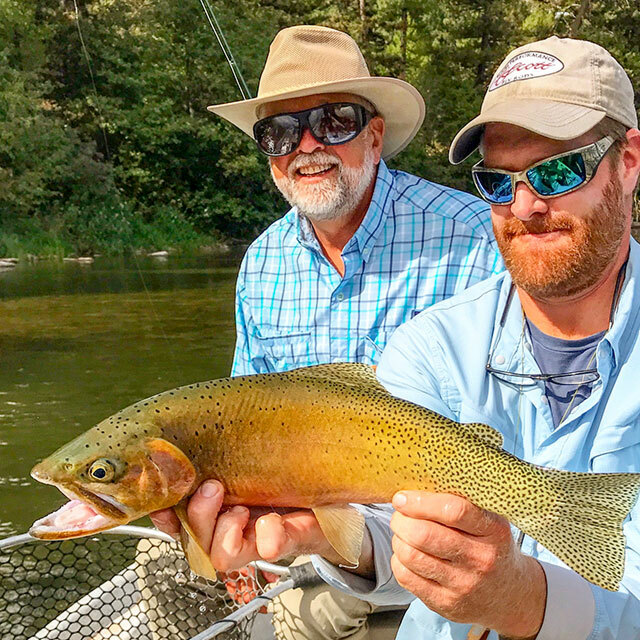 It is often referred to as “the most underrated trout fishery in the country.” The average size and strength of the Rainbows and “Cutt-bows” in the Lower Clarkfork is impressive. These 16-18 inchers are often found in “pods” sipping small mayflies and will test the skills of any angler. Fortunately, they often cannot resist a big meal presented in the right way! The Upper Clarkfork (everything upstream of Missoula) is smaller and much more serpentine. Here you will find a more traditional Cottonwood forest river bottom and more brown trout. The Bitterroot is a dry fly paradise. Our staff loves matching the diverse hatches we encounter on this river throughout its long season. The Bitterroot Valley is a bit of a “banana belt” with moderate weather often starting in February and we almost always run our first trips of the year on the “Root.” Our consistent dry fly fishing starts in Mid-March with the Skwala Stonefly. This hatch has received more and more attention in the last decade or so, and for good reason. This freestone river changes more throughout the season than probably any other river in the state. Seen from above, the lower Bitterroot reveals hundreds of old braided river channels; many are located miles from the current river bed. Every year after spring runoff recedes, it is always fun to find the new braids and a secret cold spring water side channel full of sneaky Brown Trout and Rainbows. The Upper section of the river (upstream of Hamilton) is less dynamic, but is a classic high gradient stream with cold fast water that functions as a trout haven even on a hot summer day, leading to high fish populations and consistent action. The Blackfoot River of “A River Runs Through It” lore is another incredible Missoula area option. While the nymphing and streamer fishing can be excellent in the spring, we really get excited for the Blackfoot when the big bugs show up. Sparrow sized “Salmonfly” stoneflies, with bellies the color of salmon flesh are the largest of all aquatic insects. In early June, the nymphs crawl out of the water in a hatch event worthy of a National Geographic feature. If these insects could bite, it would be a little scary, but instead the hatch creates a frenzy of fish feeding activity. Dozens of hatches follow, including on occasion, significant terrestrial spruce moths and of course everyone’s favorite, the grasshopper! Fed largely by ice cold streams flowing off the southern rim of the Bob Marshall Wilderness, The Blackfoot is the coldest of our rivers. Soon after the confluence of the main stem and the North Fork of the Blackfoot, the river flows through one of the most beautiful and lush canyon sections you’ll ever see. Few experiences get straight to the essence of fly fishing like watching a native Westslope Cutthroat peel off the cobblestone bottom and hang there to inspect your dry fly pattern in what seems like an eternity, and then pushing the surface water up to sip it in and turn back to the bottom in one quick move. Day in and day out, the Blackfoot is probably our most consistent river, and a few of my most memorable guide days have been raising huge Cutts up to blue winged olives on snowy October days up in the Blackfoot canyon. 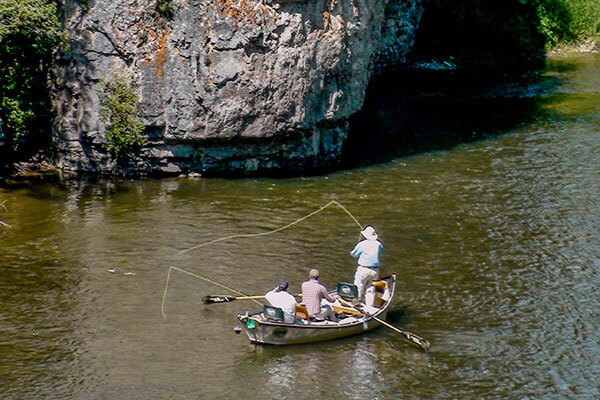 Rock Creek has often been referred to as “the perfect trout stream.” The upper stretches feature spectacular limestone cliffs, Bighorn sheep, intimate braided channels that flow through meadow land, and eager trout. The middle and lower stretches flow through the Lolo National Forest at a moderately steep gradient and is well known in fly fishing circles as home to one of the most prolific “Salmon fly” stonefly hatches in the world. A float trip during the May / June stonefly season is a recipe for a lot of action, and should be on the list of “things to do before I die.” My friend, partner, mentor and former boss, John Perry has the largest allocation of outfitting permits for Rock Creek and we work together to provide the most experienced guides on the creek. As the high water of spring recedes, Rock creek transforms into an enchanting, yet challenging wading stream. Draining more than a third of Montana’s landmass, The Missouri River below Holter Dam is Montana’s largest tail water trout fishery. The bottom flow from Holter provides perfect habitat, creating the convenient marriage between millions of aquatic insects and tens of thousands of big hungry trout. 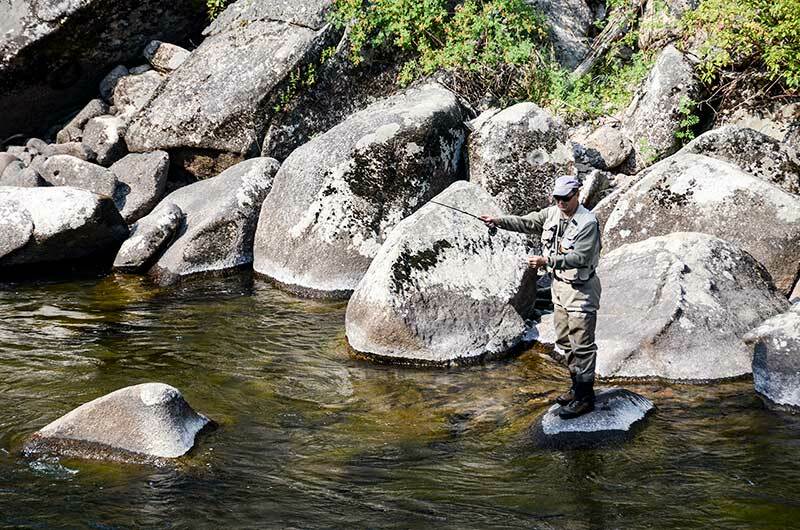 This river presents diverse opportunities for anglers of all skill levels. Whether targeting huge Brown Trout sipping tiny mayflies in five inches of water, or nymphing with the aid of a strike indicator for slab Rainbows stacked up in a big current seam, the Missouri is sure to provide plenty of “grab and grin” photos and memories to last a lifetime. Guests that have fished with us all over Montana often make sure the Missouri is included in their future itineraries. Weather permitting; we usually start on the “Mo” in early April with the emergence of baetis and midges. Overlapping PMD and Caddis hatches dominate June and July. Hoppers and other terrestrials throughout the summer and smothering tiny Trico hatches carry into the fall. We often finish out our guide season on the Missouri well into November with the Blue winged olives and Pseudocloeon mayfly hatches. Average fish size is probably larger here than anywhere else in Montana. The South Fork of the Flathead is a river set apart from time. The headwaters, the tributaries and every feeder creek that flows into the South Fork are within the boundaries of the Bob Marshall Wilderness where they are protected from human influence. With no competing use to impact the water, the result is a cold, gin clear river where the mosaic of colored stones is visible on the bottom of even the deepest runs. Come join us on a seven day trip into the world’s first designated Wilderness, home of one of the largest populations of Westslope Cutthroat in America and the largest stronghold of Bull Trout in the lower 48. The trout beckon and the pristine conditions of the Bob will remind you of the pure joy of nature. Experience a multi-day float trip like no other. Imagine a river with only one put in and one take out, inbetween are 60 miles of the best fishing and most beautiful scenery in Montana. The Smith trip begins outside of White Sulphur Springs, MT where the Rocky Mountains begin to fade into the plains of eastern Montana. 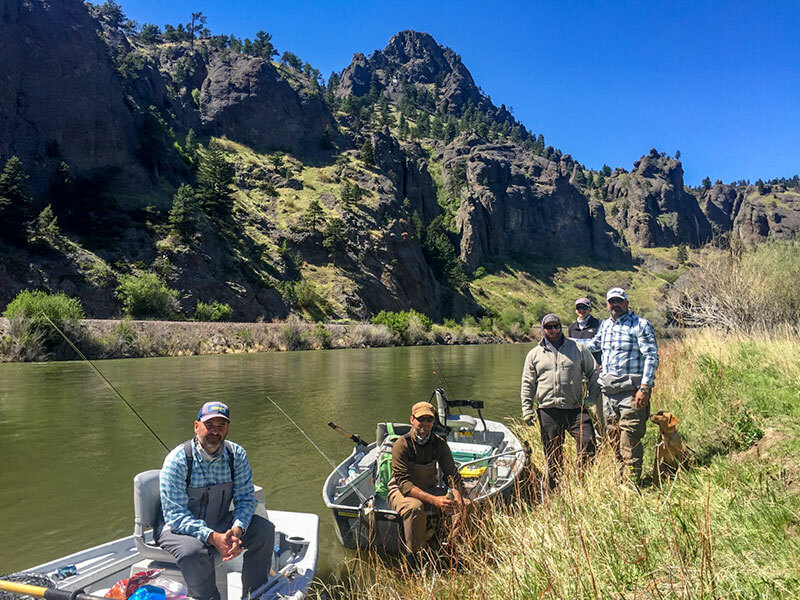 Over the course of a five day float the Smith cuts into the prairie to form a deep limestone canyon, where a feast of mayflies and stoneflies provide for an abundant population of Rainbow and Brown trout. Spend your day throwing big flies at brown trout in undercut lies at the base of 1000 foot cliffs. Then float into camp to spend the evening under the stars, telling tall and taller tales around the fire with your friends and family, a delicious meal and your favorite beverage, all with the most experienced guide staff on the river. 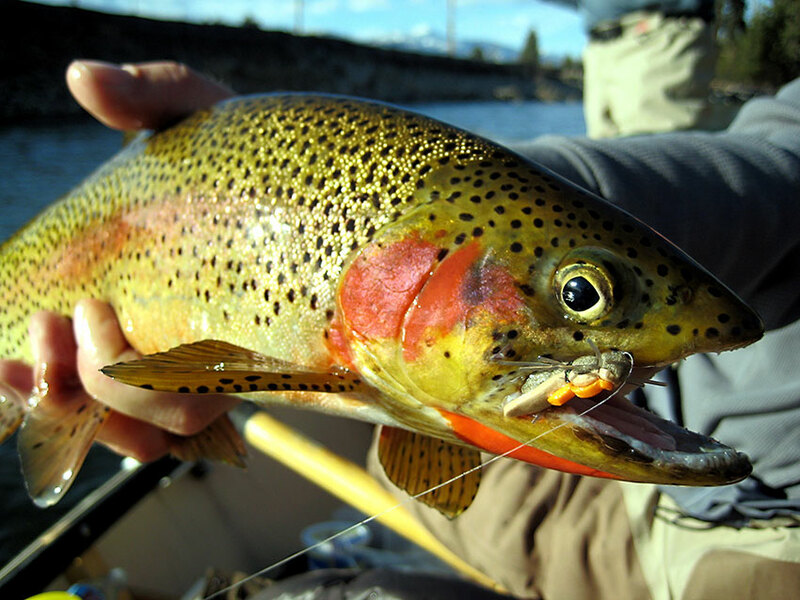 Montana Flyfishing Connection is a professional guide service formed around the angler – guide relationship. Our close-knit group of guides are passionate about sharing their knowledge with you in the pursuit of great trout. 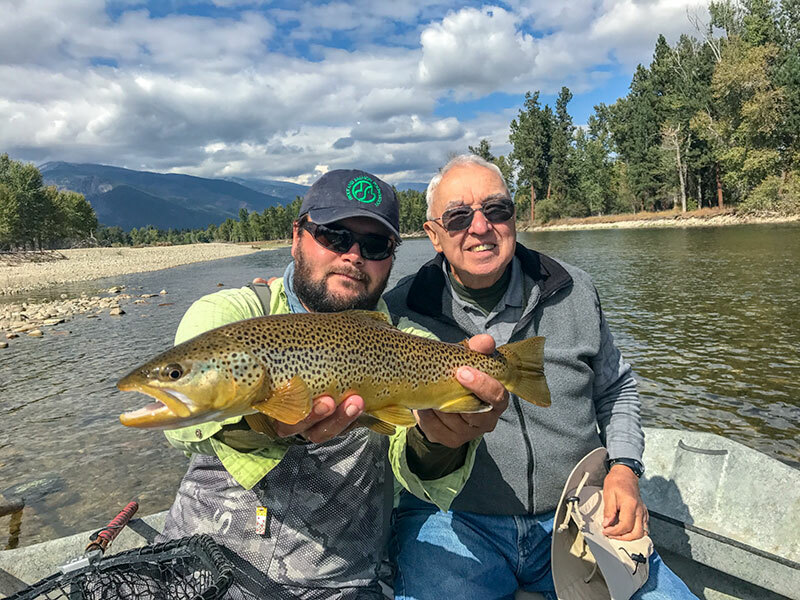 We look forward to getting you connected with Montana’s most spectacular rivers – the Bitterroot, Clarkfork, Rock Creek, Blackfoot, Missouri, Smith, Dearborn, South Fork of the Flathead and many more.